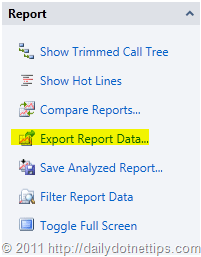 To launch Export Report Data Dialog, in Performance explorer, select the report and select “Export Report Data” from the context menu. 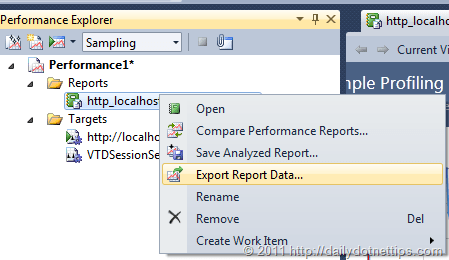 Not only from Performance Explorer , you can launch the Export report dialog either from “Report summary view window” or from “Tool bar” of different report view as shown in below images. All of the above option will launch “Export Report” dialog window. 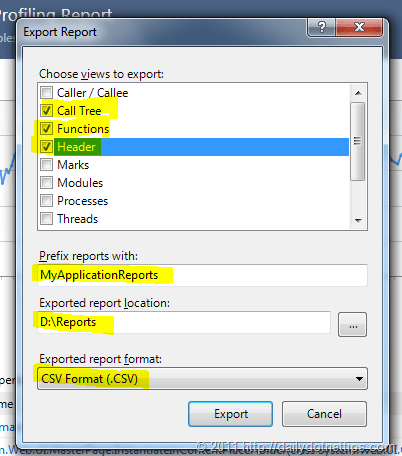 Now, as per your requirement you can select the export view ( Call Tree, Modules, Processes etc. ) from the list of option available. 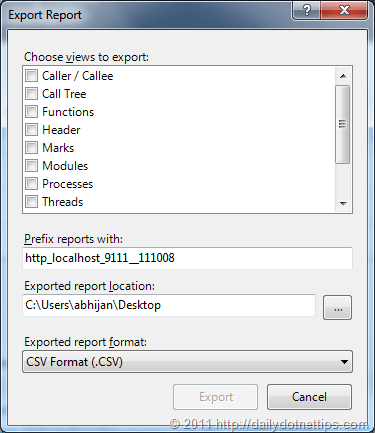 Then provide the report prefix name and select the location. Finally select report format ( either CSV or XML ). Click on “Export” . This will create different CSV files ( As you have selected CSV format ) for each and every view. To view those files, navigate to the exported report location . Another simple way to export the profiler reports, you can just do simple copy and past of the data from visual studio profiler reports.